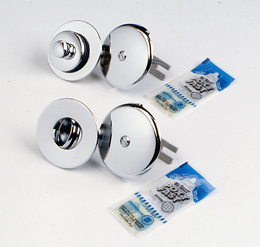 Glue'N'Drain Trim Kit - Chrome Don't be afraid of the old drain shoe plug - try Glue'N'Drain shoe plugs. With Glue'N'Drain shoe plugs, there's no need to spend your time prying or cutting out the old drain - the male adapter fits easily inside most existing drains. You will be impressed with the high quality of Glue'N'Drains. Our drains are extra wide (3" diameter), so they completely cover the old drain. And due to their tapered design, water won't collect on the edges of the drain. You'll also be pleased with how well they hold water when plugged - without the frustrating task of tinkering around with the stopper. Takes just 5 minutes to cement the Glue'N'Drain right over the old drain using super strong 2-part epoxy glue, which is included with every drain. The glue is dry and the drain is ready to use in only 15 minutes! Please note that the Plug Stop style drain must be glued into a cross bar in the existing drain in order for the drain to function. The other 2 styles do not require a cross bar. Anti-Slip Mat 90% Of All Slip & Fall Accidents Occur In The Bathroom. Protect Your Family Anti Slip Bathtub Mats & Treatment Simply The Best Protection There Is! • Will Not Mold Or Mildew Ever! • Strong Adhesive Will Not Peel Up! • Cover Damaged Bathtub Floors Too! • Easily Cuts To Fit Smaller Bathtubs! Copyright 2010. Southeast Refinishing LLC. All Rights Reserved.